In an earlier study, Viviani and Stucchi (J Exp Psychol Hum Percept Perform 18:603–623, 1992) have introduced a visual illusion, whereby it was shown that when subjects are asked to determine what movement of a light spot, when tracing an elliptical trajectory, appears to be most uniform, they tend to choose movements that are close to obeying the 2/3 power law (Lacquaniti et al. Acta Psychol 54:115–130, 1983) rather than constant speed movements, even though the actual changes in velocity could exceed 200%. Here we have extended the study of this illusion by directly testing the effect of the shape (eccentricity) and size (perimeter) of the elliptical trajectory, the duration of the tracing of the ellipse and the effect of fixation on the subjects’ decision regarding movement uniformity. We found that the ellipse’s eccentricity and tracing out speed of the elliptical trajectory significantly affect the subjects’ decisions, although the effect of eccentricity seems to be stronger than that of speed. Our findings also indicated that fixation significantly affects the subject’s decision for ellipses that are more eccentric. Surprisingly, the ellipse’s perimeter had a much smaller effect on the subjects’ decisions, although changes in the ellipse’s perimeter should have the same effect on the average velocity as changes in the time it takes to trace out the ellipse. This suggested the possibility that the subjects based their decision regarding movement uniformity on other velocity variables in addition to tangential velocity. Computer simulations we have performed have led us to conclude that the subjects’ perception of movement uniformity may also be based on assessing the variations in angular velocity and possibly also in affine velocity. Our behavioral and simulation studies thus suggest that the motion perception system is quite responsive to variations in the velocity along an elliptical trajectory but in a way that depends on the path’s curvature. Furthermore, the movement is judged to be more uniform when there are minimal differences in angular, tangential and perhaps also in affine velocities, along the trajectory. Our results suggest the existence of similar underlying constraints that affect both the motion perception and production systems when the movements are associated with very large velocities or large changes in velocity along more curved portions of the trajectory. 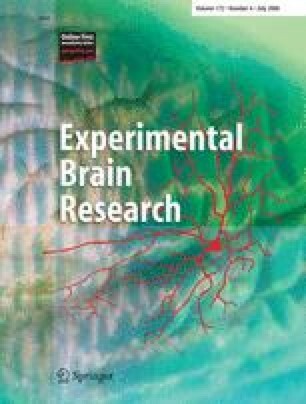 Our observations therefore provide further insight into the possibility that these constraints are either imposed by the underlying neuronal dynamics, the internal architecture of the cortical neural populations or the variables used in the coding of both sensory and motor information regarding movement. The research was supported in part by a grant from DIP (the German-Israeli Project Cooperation and by the Moross laboratory. Tamar Flash is the incumbent of Dr. Hymie Moross Professorial Chair. The material presented in this appendix is very similar to the one presented in Viviani and Stucchi (1992) although a few new definitions were added. between radius of curvature R(t) and tangential velocity V(t). Notice that for paths with no inflection points, α=0 as is the case for ellipses (Viviani and Stucchi 1992). where all the derivatives with respect to ϕ are taken at ϕ=ϕ(t). This is a separable, non-linear differential equation of the first degree that can be integrated. By inserting the solution ϕ(t) into the general parametric equations x ϕ and y ϕ, we finally obtain a movement that follows the desired trajectory as a function of time and satisfies the constraint 3. By knowing the behavior of ϕ the law of motion s=s(t) is uniquely specified by ϕ(t) since s(t)=∫ 0 t V(t)dt, where V(t) is derived according to Eq. 4. Thus, whatever the value of K, the required integration step is given by δt=T/M. Notice that T is a computational variable and not the actual period of the stimuli expressed in seconds. The latter was dictated by the number of samples and by the rate at which they were displayed.